Just when you though the Los Angeles Clippers had everything in their noodle in order they lose it again. In a season that is featuring the best Clippers team since "World B. Free" or close to that, the front office still finds a way to bump their head. 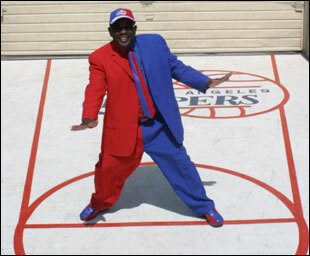 Clipper Darrell the noted longtime loyal fan of the Clippers has been asked to drop his nickname. It's not like Darrell Bailey professed himself to be Clipper Darrell because nicknames are given and stick-good ones anyway and that is exactly how he became known as Clipper Darrell..
Carl Lahr senior vice president of marketing and sales, eventually returned Bailey’s call last week and informed him that the organization didn’t need him doing stories or speaking to the media on behalf of the team. Now could the Clippers be right? Could Clipper Darrell have been a loyal fan for so long to cash in once the team became respectable on the hardwood? If you saw anything of the Clipper since San Diego you'd really find that hard to believe. Either way not a good message to send to the fans. On the business side you can understand but in a year where every team should be doing their utmost to keep the fans and bring back those that were ill about the lockout it's not good. And really does it matter because he's known as Clipper Darrell, anyway and probably always will be. I'm thinking maybe he should pull a Metta World Peace, then it would not be a nickname issue. 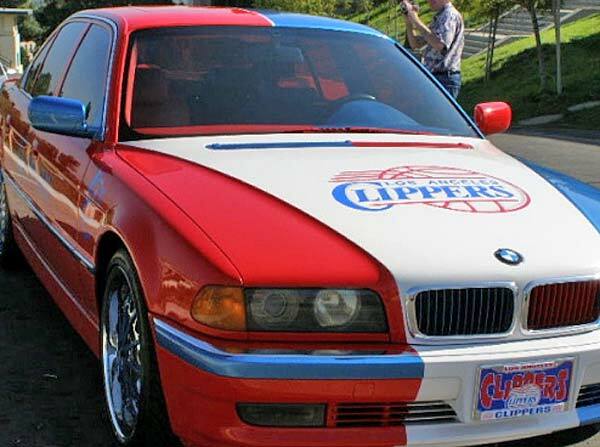 Plus if your driving this around town everyday then you deserve to be called Clipper Anything and oh that suit also. Why not bring him on the payroll then? Bailey donned an all black suit at the Clippers home game against the Minnesota Timberwolves. You kind of get the feeling it's going to be a long rest of the season for Bailey and now the question will be does he renew for next season or show up at Staples with a purple and gold suit on, how ironic would that be. Well they say it's a Lakers town anyway.